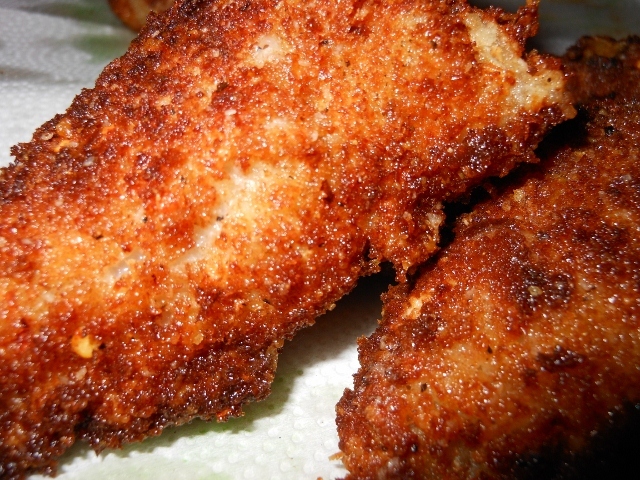 We decided to try some parmesan crusted fish this week. I had some ocean perch on hand that fried up very nicely. It was very good, we used wheat bread for the bread crumbs and fresh grated parmesan cheese. Quick and easy to do, I am sure other kinds of fish would work well too. Thaw fish and pat dry. Combine four, salt and pepper in small dish. In separate bowl beat eggs. In another bowl combine bread crumbs, parmesan, salt, pepper, and crushed red pepper. Heat oil in large skillet. Bread fish by dipping in flour combination. Then dip in eggs, followed by a dip in the parmesan and bread crumb mixture. Fry about 5 minutes total depending on size of fish; 2 to 3 minutes each side. We decided tonight to go with a broiled technique for our mahi mahi. A simple technique for fixing fish. It could be seasoned anyway desired. I’d gotten a new seasoning blend for christmas that is called Peri Peri seasoning; a spicy blend with cayenne, fenugreek, cardamom, cumin, and allspice …. just to name a few of the ingredients. Sounded like a strange combination but it all worked very well together and was nicely spicy. Oil baking sheet well. 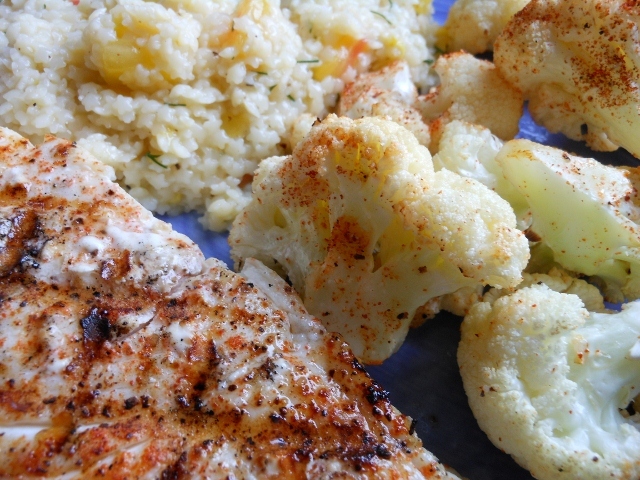 Place fish on baking sheet and season both sides with desired seasoning; even just a little salt and pepper is great. Broil about 3 inches from heat for 5 minutes. Flip over and broil an additional 4-6 minutes until cooked through. It may sound like a fantastic splurge for have lobster tails for dinner, but at the grocery the other day they had frozen raw lobster tails for $6 each. I couldn’t resist picking up a couple for dinner. Oh so delicious. They were about 6 o.z. each and we thawed them before cooking. I let Charles do all the hard work; he cut the shells open and made a tasty butter with lemon and garlic to drizzle over them. Cut open top of shells and remove the first few segments of shell. Drizzle with butter; plain or seasoned to your liking and broil 2 – 3 inches from heat or about 1 minute per ounce; we did ours for about 7 minutes; shells will turn bright and meat will be white and lightly toasted. Serve with extra butter for dipping. I love good catfish, it’s hard to find in the stores most days and I’m not much of a fisherman so when my boss got in a case of catfish fillets for a banquet I had to get some of the extras from him. 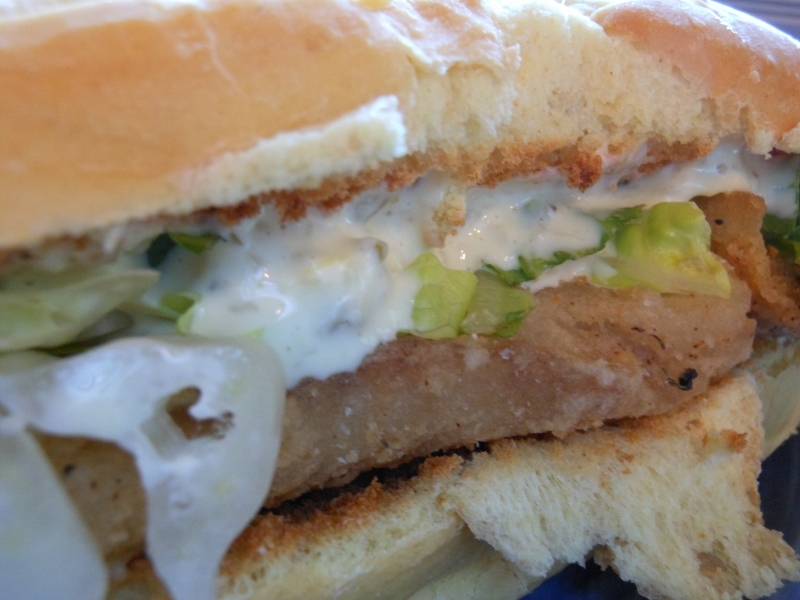 It was a very mild farm raised catfish. So moist and tender; I like a combination of cornmeal and flour; I always have troubles getting it seasoned just right but I hate to overdo. Mix together cornmeal, flour, and spices. Adjust to your liking. We enjoy a bit of heat and a salty mix; this however wasn’t overly seasoned in any way so I added a sprinkle of cayenne and salt after frying. Heat about 1/4 – 1/2 inch of oil in a large skillet. 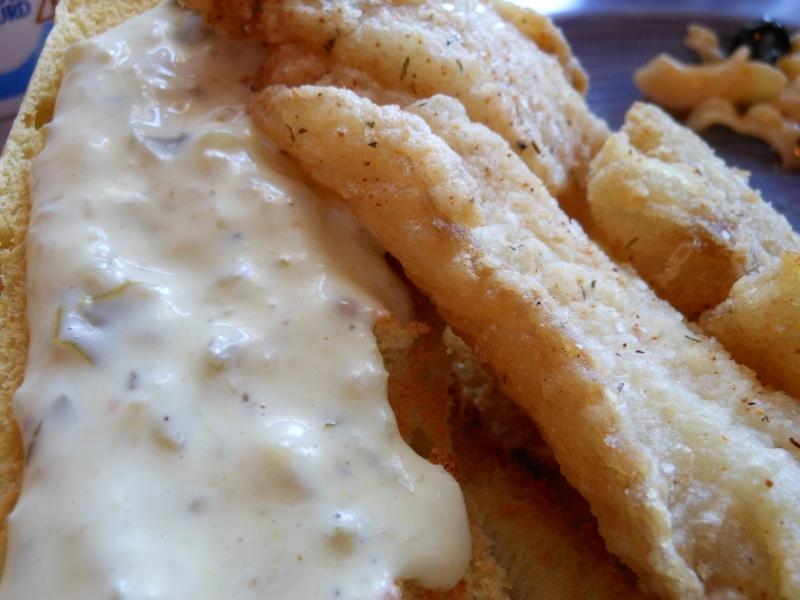 Toss fish fillets in flour mixture and shake off excess. Our fillets were cut in half and about 3 o.z each I would estimate. Once oil is hot fry for about 3 minutes each side or until fish flakes easily. We love fish. Just about every kind fixed just about any way. 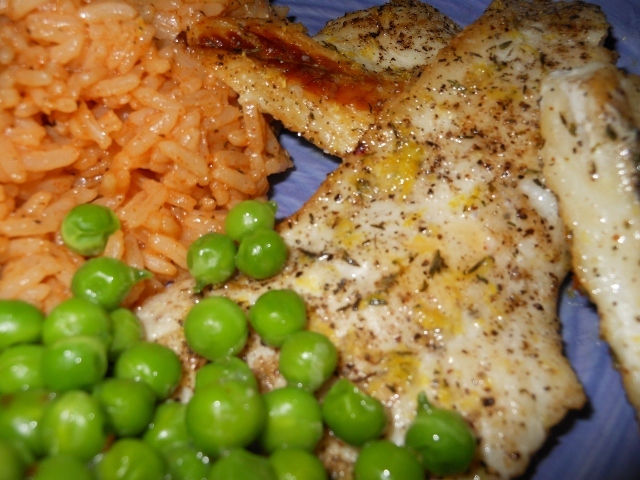 Today we went with a pan seared ocean perch. Just a simple seasoning and a little olive oil. 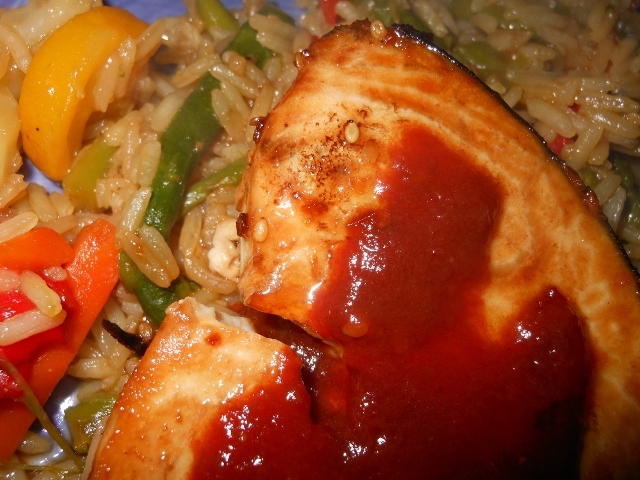 Good texture, not a very “fishy” fish, and it’s quick and easy to make. Heat olive oil in large skillet over medium high heat. 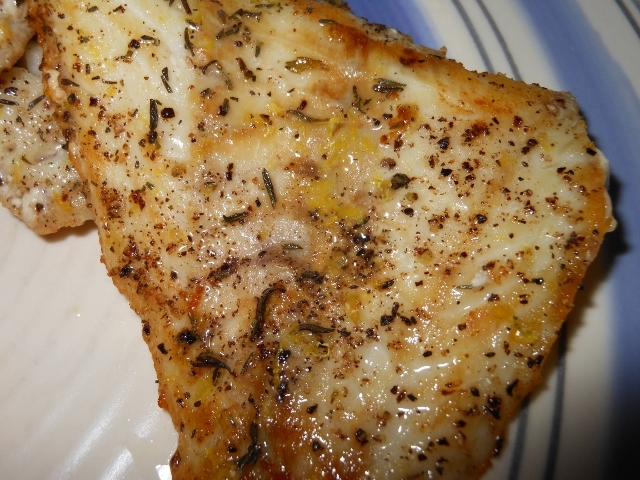 Season fish with salt, pepper, and thyme. 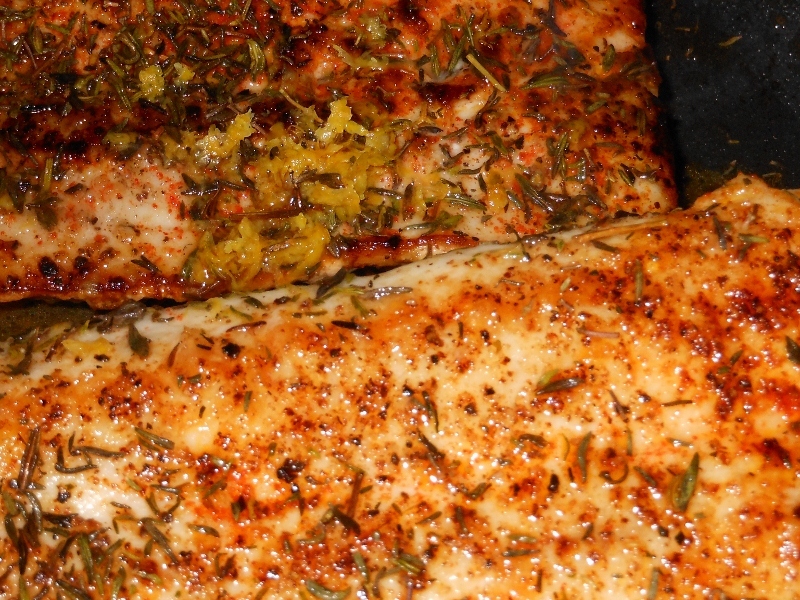 Add seasoned fish to skillet and cook for about 3 minutes each side until cooked through. While cooking sprinkle with the zest of one lemon and finish by squeeze juice of half the lemon on top. Just a quick post for tonight’s dinner. I fixed some stir fry vegetables with rice and fish. Very tasty and easy to do. I had a frozen vegetable blend with asparagus and squash but any combo will do. Bring stock and teriyaki to a boil. Add rice and reduce heat simmering for about 15 minutes or until rice is tender. Meanwhile in skillet heat vegetables over medium high heat for about 5 minutes or until thawed and warm (you could use a microwave if you prefer). Add vegetables to rice during last few minutes of cooking. Remove rice and vegetables from heat and allow to rest covered for about 5 minutes. 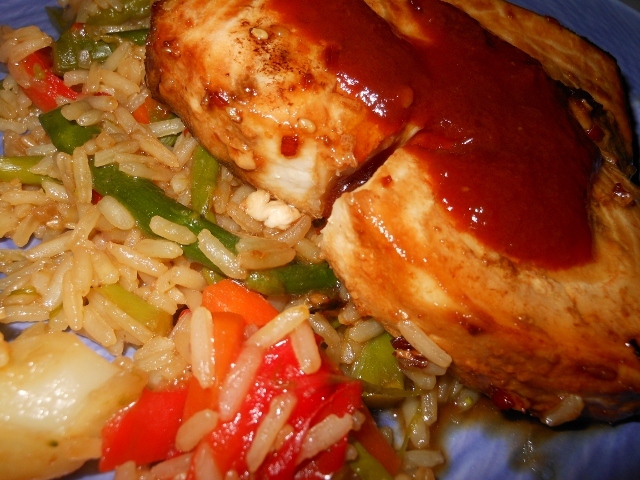 I served mine with swordfish today ~ I cooked the fish with some teriyaki and topped with a little red hot sauce for an added kick. 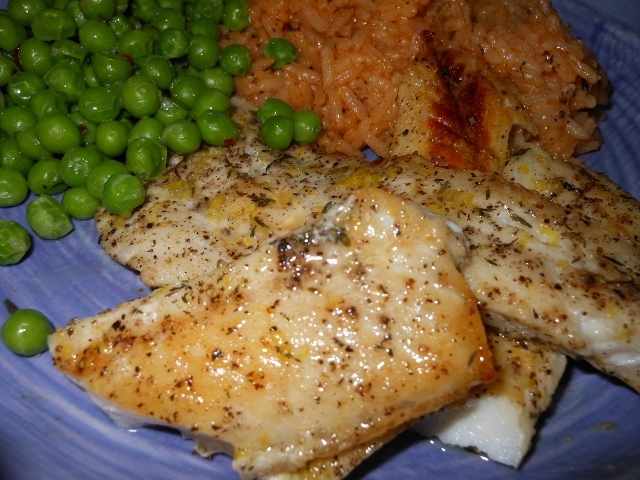 Just a quick post today for the halibut Charles grilled yesterday. It was very simple and quick to make. Only about 8 minutes total cook time and a simple seasoning made for a fast lunch. 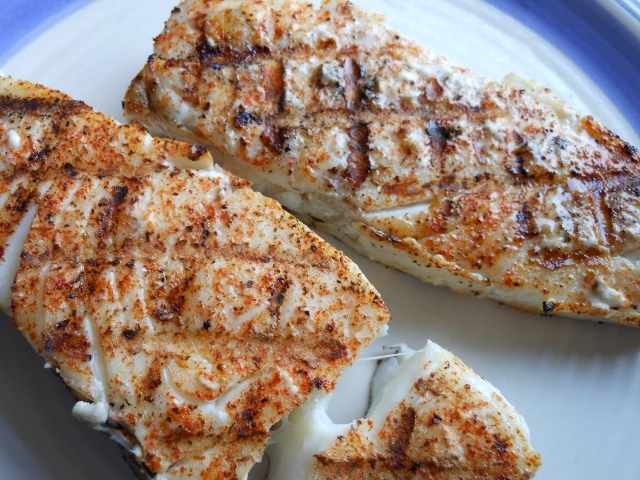 Adjust the cooking time if using a different type of fish; not all types are great for grilling but halibut being a fairly firm fish is ideal; it is relatively low in fat so make sure and oil your grill well or brush with olive oil while cooking. Heat grill to high heat. Oil grates and reduce to a medium high type heat. If using charcoal it will still be direct heat, but lift rack up a notch or two. 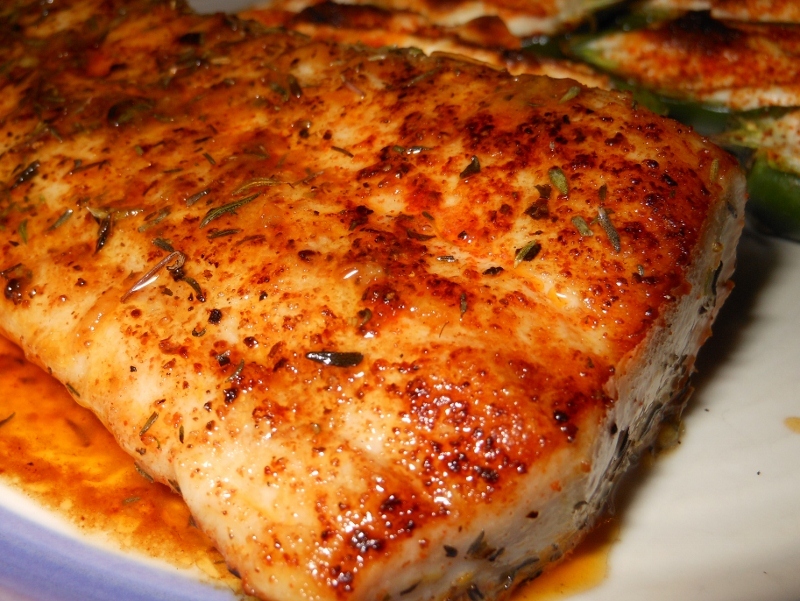 Season fish and place on oiled grates; cook or about 4 minutes each side; until fish flakes easily with a fork. I realized today I haven’t posted many fish techniques. We have seafood and fish quite a bit but apparently I’ve not documented many recipes. Today we went with a pan seared and steamed approach. I really enjoyed this; I used to not care so much for lemon but I have become quite fond of it in recent years and the combination of lemon and thyme is just wonderful. Thyme always brings up a nostalgic sort of feeling when I smell it warming. I remember mom sprinkling it on canned tuna when we were kids and warming it up in the microwave; sounds strange perhaps but thyme is wonderful with fish no matter what kind you use! Warm non-stick skillet over medium high heat. Add olive oil. 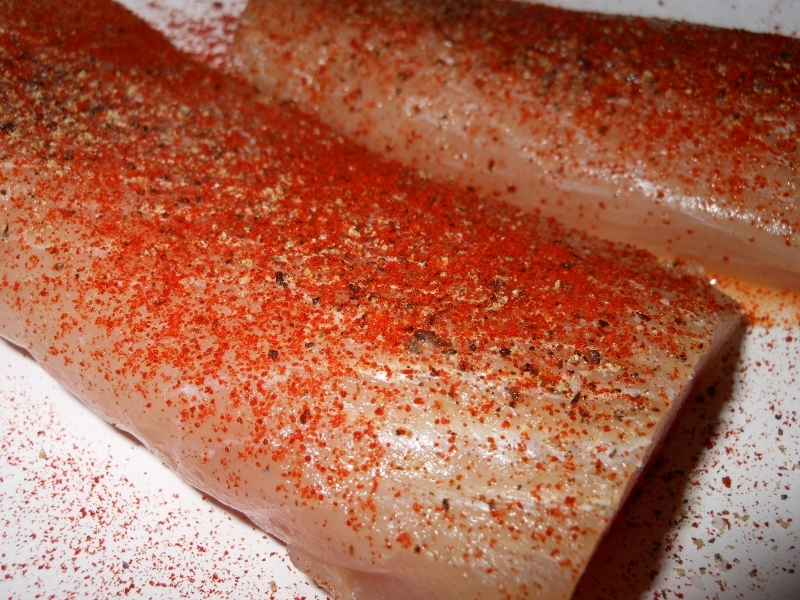 Season fish with salt, pepper, and paprika. Add to hot skillet; cook for about 2 minutes. Flip over and cook an additional minute. Add remaining ingredients and heat for about 30 seconds. Cover and remove from burner. Allow to steam for an additional 2 minutes before serving. Pour pan juices over fish.